The Lakes Aquarium is home to hundreds of amazing creatures; showcasing local wildlife from around the Lake District and more exotic species from around the world. 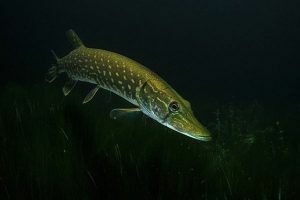 The Pike is the supreme predator of the lakes, and they have been known to attempt to eat fish of their own size. They grow to be on average 40-55cm long, although the largest recorded Pike to be caught on Windermere was 110cm long. They are typical ambush predators, who lie in wait for prey, camouflaged amongst the weeds, and then catch passing prey at speeds of up to 60km per hr. The Arctic Charr is one of the most important species in the Lake District. Native to alpine lakes, arctic and subarctic coastal waters, they are the most northerly of any freshwater fish. Their presence in the Lake District is seen by environmentalists as an important barometer of climate change because they are at the southernmost limit of their natural territory. Found in the north-eastern Atlantic, the Thornback Ray can be found locally in Morecambe Bay and in our downstairs, At the Seaside, area. 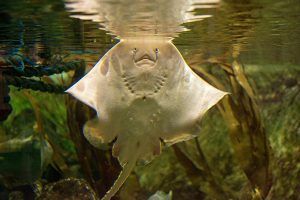 Like all rays, they have flattened, kite-shaped bodies with a long, thorny tail. They might just look like straight-bodied seahorses with tiny mouths, but they are in fact, pipefish. 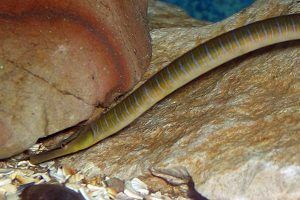 Pipefish don’t swim well due to their long, pipe-like shape, instead they move around very slow around and need to rest often. Take a journey below Lake Windermere and see our amazing diving ducks in action. These ducks are known as “gregarious”, meaning they’re found mainly on fresh water and estuaries, where they find their food below the surface of the water. They are strong fliers but have some difficulty taking off, usually having to run across the water to gain enough speed to take off. 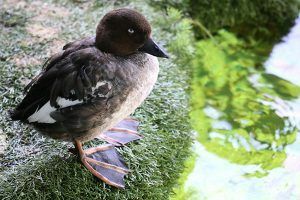 Diving ducks have their legs further back on their bodies than other ducks to help propel them underwater, although this does make walking on land a little awkward! Join us daily for a Lake Tunnel Duck Feed to see them dart and dive for their food! 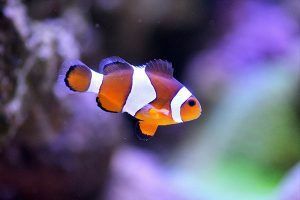 Stars of the silver screen; Clownfish are instantly recognisable by their orange and white striped pattern. They’re native to the warmer waters of the Indian and Pacific oceans and live in shallow lagoons and sheltered reefs. 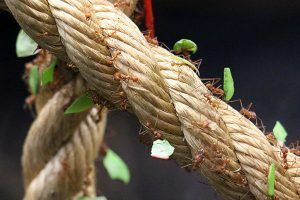 Head into the Rainforest and you’ll find our spectacular display of leafcutter ants. These tiny creatures are found in the tropics of South and Central America and can carry up to 20 times their own body weight. Journey through the Americas and see the sharp toothed, omnivorous piranha. 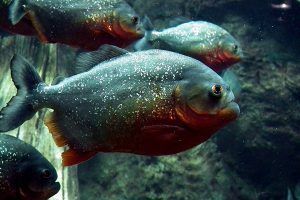 Piranhas are omnivorous (meaning they will eat food of both plant and animal origin) and have one of the strongest bites of all bony fishes, thanks to their powerful jaw muscles. 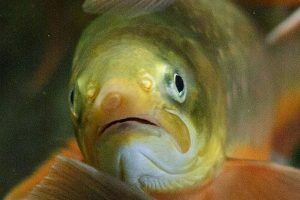 The freshwater Blind Cave Fish is found in the eastern regions of Central America. As their name suggests, they are completely blind. As they live in dark underwater caves, they have over time evolved to have no eyes and no skin pigment. Instead the fish are equipped with extremely sensitive organs which warn them of obstacles in their path. 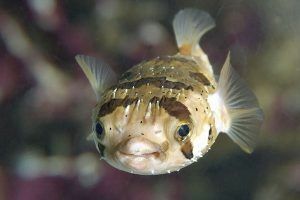 There are more than 120 species of pufferfish worldwide, mostly found in tropical and subtropical ocean waters. Due to their clumsy swimming style, pufferfish can be quite vulnerable to predators. In lieu of escape, they use their highly elastic stomachs and the ability to quickly ingest huge amounts of water to turn themselves into a virtually inedible ball several times their normal size. The Lakes Aquarium is home to a pair of Oriental small clawed otters, the smallest of the world’s 13 otter species. They naturally inhabit mangrove swamps and freshwater wetlands in South and Southeast Asia, where they live in extended family groups. 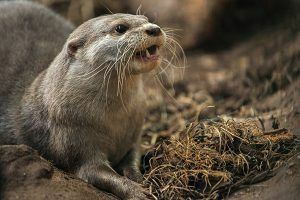 Due to ongoing habitat loss, pollution and hunting in some areas, these otters are listed as Vulnerable on the IUCN Red List. You’ll have to be quick to spot these little creatures as they run through the grasses! 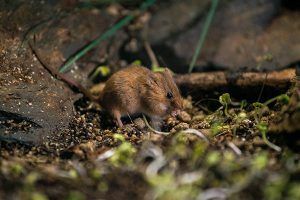 Harvest mice are native to Europe and live in long grassland, reed beds, hedgerows and around woodland edges. They are the smallest European rodent, with the adults weighing as little as 4 grams. The world’s rainforests are home to more than 4,000 different species of frog, of all different shapes, sizes and colours. 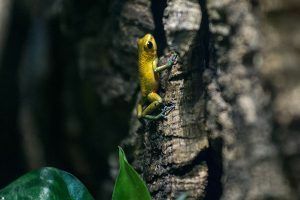 Here in the Aquarium you’ll find frogs a plenty in our Rainforest area, including blue poison dart frogs, dyeing dart frogs and strawberry dart frog. All tropical rainforest frogs are meat eaters, eating almost anything that will fit in their mouths. Commonly mistaken for fish these “walking fish” are actually amphibians. As of 2010, wild axolotls were near extinction due to urbanization in Mexico City and consequent water pollution in the surrounding area. 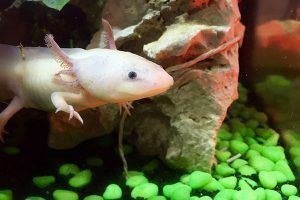 Axolotls are able to regenerate their limbs, rebuild their jaws, spines and even brains without any scarring.